There have been many proposals over the years for making the fighter a more interesting class to play. In OD&D, fighters can use any weapon or armor (including being the only class that can use magic swords). In addition, they can make one attack per round per hit die against enemies of 1 HD or less. Supplement I: Greyhawk added a weapon vs. AC table (pages 13 and 14). This applied to all classes, though fighters probably made the most use of it just because they were most likely to enter direct combat. AD&D added weapon vs. AC, weapon space required, weapon speed factor (PHB page 38). Second edition added weapon specialization. This is another bonus mechanic that could stack with ability bonuses and magic bonuses (did AD&D have a specialization system, maybe in Unearthed Arcana?). Third edition added combat feats which allowed further bonus optimization and access to new powers (and recast weapon specialization as a series of combat feats). 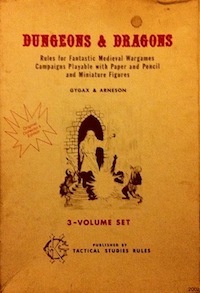 Fourth edition practically eliminated basic attacks (other than for opportunity attacks) and gave the fighter a stable of spell-like powers, including stances (buff-style persistent bonus powers, only one of which can be active at a time); 4E also retained maneuvers as combat actions such as bull rush, charge, and total defense (4E PHB page 286). Practically speaking, the ability to use all weapons and armor is quite formidable. Psychologically, “lacking penalties” is not very enticing. This advantage is further eroded when players (myself included, sometimes) chafe at weapons restrictions for other classes. While it’s true that probably all characters use weapons to some degree, it is the fighter that should, in my opinion, be the “weapons” class. Regarding the fighter having the best combat attack bonus, every other class has a combat bonus (**), the fighter just has the best bonus. This is something of a problem, as, to use Second Edition as an example, a 7th level cleric is better at fighting than a 4th level fighter (THAC0 16 vs. THAC0 17, 2E PHB page 91). At no level is a fighter ever better at spell casting than a magic-user or cleric. Returning to the idea that the fighter is the “weapons” class: why not bring back some version of the weapon vs. AC table, but only apply it to fighters? In order to do this reasonably, the modifiers must be all bonuses, as we don’t want fighters to be worse than other classes when using a specific weapon. This gets away from the simulation aspect of weapon vs. AC, but as simulation is not really my primary motivation here, that does not bother me. Some weapons are versatile and can be used in more than one way. For example, a sword can be used as a piercing weapon or a slashing weapon, so the fighter can use whichever category gives the best bonus. I haven’t tried matching these categories against types of armor yet, but I can’t imagine that I would need more than 5 (multiplied by 2 due to shields): unarmored, leather, chain, light plate (encompassing scale and banded), and plate. I expect that this should be by named type rather than by armor class, which should allow it to be licensed under the OGL without needing to ape the SRD. Rob Conley took a similar approach in this Grognardia comment. These bonuses are only applied against corporeal enemies. For enemies with some form of natural armor, the referee should just make a ruling if the player asks. For example, a bear could be considered as leather or hide armor, and a dragon could be as plate. Some enemies may be so tough that they have no tactical weapon weaknesses (such as an iron golem). There is no need to be too systematic about this, as different enemies of the same type can still have some level of uniqueness. There is also no need for the referee to worry about it; it is the player’s responsibility to make sure these bonuses are active (which even makes sense narratively, if you think about it, because a fighter would have to proactively attempt to exploit the weaknesses in an enemy’s defenses). This approach has a number of practical benefits. One of the reasons that the weapon vs. AC modifiers are ignored is that if the rules are applied generally they add complexity to almost every attack roll. Since all the modifiers are modeled as bonuses, the fighter’s player has an incentive to keep track of them. It even makes sense under this regime for the DM to ignore these bonuses for most NPCs, since most NPCs are not classed fighters. Using this rule, I would expect that most non-fighter characters would carry one or two weapons to use in a support role, but that fighters would carry a whole host of weapons so that they would have one for each possible situation. This just feels right to me. Win, win, and win. I have no problem with weapon-vs-AC being used at the same time as variable damage dice. In D&D armor and hit points simulate different things. I am actually considering using it with class-based damage. Characters will roll their hit die for damage (there is a similar idea in this Grognardia comment). Larger or two-handed weapons will be: roll two dice and take the highest. Thus, fighters would use d8, clerics d6, elves d6, magic-users d4, etc. A magic-user can use a two-handed sword, but it would only do 2d4 take the highest damage, and the magic-user would not be able to apply any bonuses for slashing or piercing. This incentivizes smaller (for encumbrance purposes) and cheaper weapons, which seems to make sense. Why spend extra money and backpack space on a military weapon if you are not trained to use it? 2003 05 12 Dragonsfoot Weapon vs Armor Type – Natural Armor? 2011 07 16 Huge Ruined Pile “Alternative Combat System” + Weapon Type vs. AC matrices – any interest? One final note: the OSR Search Engine I put together was very useful in doing the research for this post. (*) Well, in systems that use weapon proficiencies, fighters are not proficient with all weapons, but they do get the most weapon proficiencies by a large margin. (**) – Excepting LotFP, where no classes other than the fighter ever get better at fighting. I think this is quite inspired for a number of reasons, not least of which is the way this rule combats bonus inflation. This entry was posted in Uncategorized and tagged combat, fighter on November 10, 2011 by Necropraxis. Hmm, yeah, great thread. I have really found it to be quite slow going trying to construct a table of weapon versus armor bonuses that I am happy with. It is a vexing subject, and yields little at the table in exchange for the effort involved, I find. That is why I tend towards simplicity and abstraction in the general case, reserving details for specific instances of interest.